Love this post! I’m so glad you choose to blog. Ahh you are so sweet! I find it so nerve-wracking working on a post, unsure how it’s going to be received – then it’s just so lovely having kind people stop by with encouragement. Definitely worth the effort! Well this post made me decide to be brave and post my first comment. We have just completed our first year of home schooling after moving to the UK and while we are still finding our way and style, I am a complete convert and feel empowered by the freedom. I have signed up to many blogs and quietly read them without leaving comments. Over the last year I have time and time again found great comfort particularly in your blog and taken away some fantastic resources and ideas – poetry morning tea is one of my kids (7 and 4) favourite parts of the week! Now both my daughter and I are going to start our own blogs as a record for us to look back on our adventures and to share with our family and friends on the other side of the world. Thanks for unknowingly supporting me in my first year of homeschooling. Angela – you’ve made my day! I can’t tell you how happy it makes me to hear that anything I’ve shared here has contributed in any way. I do hope you come back and let me know the name of your blogs if you ever feel ready to share them; I’d love to read about your homeschool journey! Thank you so much for taking the time to comment. This was so much fun to read! 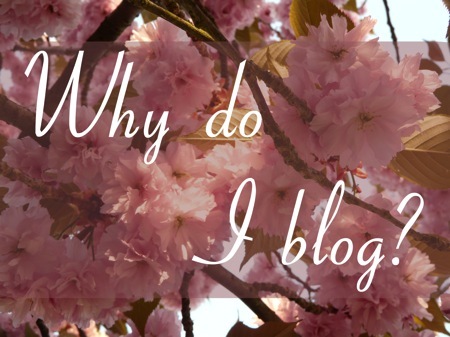 Thank you for sharing your journey and thank you for blogging. I really appreciate and enjoy your (blog) friendship and wisdom. I’ll agree with everyone else, this was a lot of fun to read, and I really enjoyed seeing why you blog. It really is a big thrill when someone says they were inspired by your blog. Thank you Ticia – and for being the first blog I linked up to! Thank you so much for your encouragement, Betsy! I really appreciate it. I know what you mean about how reasons for blogging evolve. I get so much more out of this than I’d ever anticipated when I started out. Your blog looks like a wonderful resource for homeschooling mums whose kids are approaching or in high school. I’d like to think that by the time we get to your stage there will be even more generous women blogging about their experiences of homeschooling teens. I really enjoyed this, Lucinda. I love the idea of combining the skills you learnt as a cognitive therapist with those you’ve learnt as a home school mum and helping others. I think you’d be brilliant at it! Thanks for the inspiration and the encouragement, Claire 🙂 Maybe you can send me clients one day! This is really interesting, You are a very skiilled blogger. they are discussing on the web. You actually realize how to bring a problem to light and make it important. me. In my view, if all website owners and bloggers made excellent content material as you probably did, the web can be much more helpful than ever before. I’m a little late to your post, but I’m so glad you blog! I suspect my daughter has dysgraphia and while waiting to get a formal evaluation (or wondering if the expense is worth it now that we are starting to find things that are working), I stumbled upon your blog. I’m SO thankful for all of your postings on this subject and love reading your posts! Thank you! Thank you! While all the things I’ve shared on this blog have been worth doing, I admit my son (now 10) still doesn’t love writing. We plan to have him assessed next year so that he’ll be allowed to use a keyboard in the exams he’ll sit when he’s 16. Because he still struggles to write, he’s been working really hard learning to touch-type with Nessy Fingers, which I hope will serve him well. He also still does handwritten copywork several times a week just to make sure he can write legibly for forms, cards etc. Thank you again for your comment! Have a wonderful day!